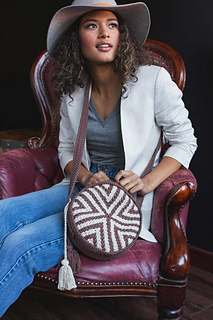 Round bags are back in style! 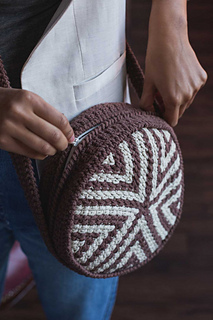 The Rotatoria Purse is a practical and elegant circular crossbody bag. 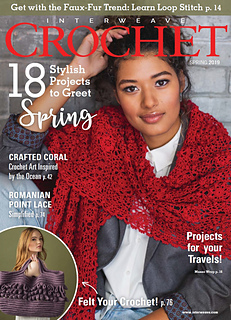 It is worked in the round and based on a double crochet tapestry technique. 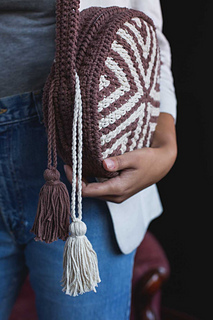 The bag closes with a zipper and is embellished with two elegant tassels. FINISHED SIZE 9” in diameter and 2¼“ deep, excluding strap. YARN Paintbox Yarns Cotton Aran (distributed by LoveKnitting) (100% cotton; 93 yd (85 m)/1¾ oz (50 g)): #611 coffee bean (A), 5 skeins; #608 vanilla cream (B), 2 skeins. NOTIONS Yarn needle; 11½” long zipper, 1; 3½“ cardboard square, 1. GAUGE Rnds 1–5 = 4” diameter in patt.